If you’re looking for a relatively easy craft to add to your repertoire, glass etchings not only look sophisticated and elegant, but are also not as time-consuming or complicated to create as you probably think. Actually, creating designs on glass are just as easy as applying a cream or liquid, and then rinsing away. Before you incorporate this unique product into your small business lineup, consider the materials and tools needed to complete a project. You can etch nearly any glass surface, but the easiest surfaces to work with are flat or have simple curves. It’s less complicated to apply stencils to these types of surfaces. You may also etch colored glass when it is a true color and not coated. 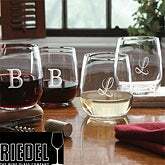 In no time, you can create similar products to the Riedel® Personalized Stemless Wine Glass Set . The easiest way to etch glass without sandblasting a surface is to use liquids and creams that contain ammonium bifluoride. This process transforms the surface of glass to create a permanent frosty, matte surface that takes about 15 minutes to complete. Use a plastic, T-shaped squeegee to smooth out the adhesive stencils, apply etching cream, and replace excess product into the bottle. To protect your eyes and skin from the chemicals in etching cream, you should also get a pair of rubber gloves and protective eyeglasses. To protect the portion of unetched glass, you will need a resist, which covers the surface. The most common type of resist is a stencil that has been cut into different shapes. Other options include self-adhesive vinyl, resist gel, and found objects. You can also purchase some stencils with an adhesive backing, or you can use spray adhesive to attach. Resist gel eliminates the inconvenience that sometimes comes when working with stencils or other complicated resists. The gel is applied using an applicator bottle, or a brush for larger spaces. Simply apply the resist gel, allow it to dry, and then apply the etching cream or liquid over the gel. Rinse off thoroughly, and then wipe off the gel. An applicator bottle is needed to hold the etching cream or resist gel. Choose a bottle that offers a variety of tips, which will allow you to create lines with different widths. Some people prefer to work with a paintbrush, especially when creating freehand designs. If you are creating stencils of your own, then a pair of scissors or craft knife will come in handy. Planning on rounded shapes? Choose a swivel blade.